John Keats; William Brown. Macdougall Isabella, or The Pot of Basil. Illustrated and decorated by W. B. Macdougall. Isabella, or The Pot of Basil. Illustrated and decorated by W. B. Macdougall. 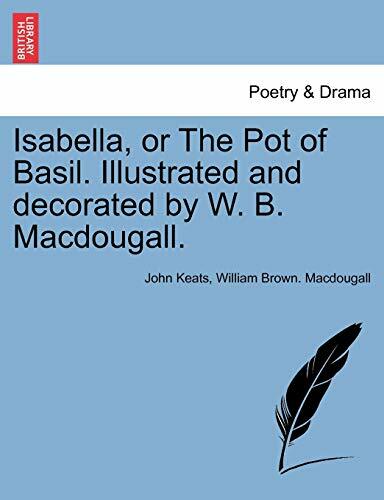 Title: Isabella, or The Pot of Basil ... Illustrated and decorated by W. B. Macdougall. John Keats (1795-1821), born in Finsbury Pavement in London, was one of the principal poets of the English Romantic movement. Keats died of tuberculosis at the age of twenty-five. 2. Isabella, or The Pot of Basil. Illustrated and decorated by W. B. Macdougall. 6. Isabella, or The Pot of Basil. Illustrated and decorated by W. B. Macdougall. 7. Isabella, or The Pot of Basil. Illustrated and decorated by W. B. Macdougall. 8. Isabella, or The Pot of Basil. Illustrated and decorated by W. B. Macdougall. 9. Isabella, or The Pot of Basil. Illustrated and decorated by W. B. Macdougall. Keats, John; Macdougall, William Brown. 10. Isabella, or The Pot of Basil. Illustrated and decorated by W. B. Macdougall.